Air Instro, Inc. is an approved FAA Repair Station# A7ER329J providing excellent quality in instrument and accessory overhaul. Air Instro, Inc. holds the following ratings: Instruments Class 1-2-3-4 and Accessories class 1-2-3. We provide support to the Military, Commercial, and General Aviation Industries. 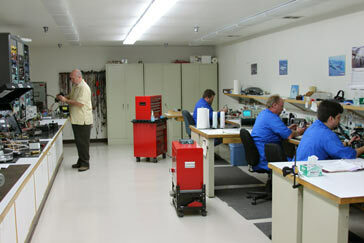 Our Repair Station has the equipment and technical data to service many aircraft instruments and accessories. Some of the instruments we frequently overhaul are tachometer indicators, temperature indicators, fuel quantity indicators, gauges, synchros and pressure transmitters. Our capabilities support various aircraft such as A4, B-727, B-767, Bell 200’s, CH3, CH46, CH47, CH53, DC-8, E2, E3, F4, F5, F15, F16, F18, L100, MD-80, P3, UH-1, UH-60, and we specialize in C-130 aircraft. Quality is of utmost importance to us. We strive to maintain the highest level of workmanship. Excellent customer service is our priority.